Many may by now be aware of a story making the rounds - on the internet, on blogs and on Facebook and Twitter - that the world's last manual typewriters have been made and the factory, in India, has been closed down. According to the story, only about 500 typewriters remain to be sold, most of them in the Arabic language. I am led to believe the machine pictured above is one of the Indian-made models. Please let me know if this is not the case. I have never seen one, so I wouldn't know. Let me say from the outset that this claim seems dubious, because to the best of my knowledge manual portable typewriters continue to be made in China. Maybe someone can confirm this? Or enlighten me if the end of the line with models such as the Rover, Generation, Olivetti-Royal, Olympia Traveller C et al has already been reached. The story starts: "India-based company has just a few hundred machines left in stock. It's an invention that revolutionised the way we work, becoming an essential piece of office equipment for the best part of a century. But after years of sterling service, that bane for secretaries has reached the end of the line. Godrej and Boyce - the last company left in the world that was still manufacturing typewriters - has shut down its production plant in Mumbai, India, with just a few hundred machines left in stock. Although typewriters became obsolete years ago in the west, they were still common in India - until recently. Demand for the machines has sunk in the last 10 years as consumers switch to computers. The company's general manager, Milind Dukle, told India's Business Standard newspaper: 'We are not getting many orders now. From the early 2000s onwards, computers started dominating. All the manufacturers of office typewriters stopped production, except us. Till 2009, we used to produce 10,000 to 12,000 machines a year. But this might be the last chance for typewriter lovers. Now, our primary market is among the defence agencies, courts and government offices.' The company is now down to its last 200 machines - the majority of which are Arabic language models. The firm began production in the 1950s - when Prime Minister Jawaharlal Nehru described the typewriter as 'a symbol of India's emerging independence and industrialisation'. It was still selling 50,000 models annually in the early 1990s, but last year it sold less than 800 machines. The first commercial typewriter was produced in the US in 1867 and by the turn of the century had developed into the standardised format - including a qwerty keyboard - that we know today." As you can see, there is at least one very basic fact in there that the newspapers, magazines and websites have got wrong, but as to the claim about these being the last "new" typewriters left in the world, I have, as I said, reservations. Only last weekend a Rover went on sale on eBay in Australia, and the seller indicated it had been bought new earlier this year. But many will be aware of just how quickly - especially in these days of supposedly rapid worldwide communications - stories, false or otherwise, can spread and become entrenched in people's minds as accepted wisdom. At 6.30 this morning, I was awoken by ABC Radio to be interviewed live on air about the Mumbai typewriter story - the interviewer, of course, presuming it to be correct. Regardless of whether the story about these being the last "new" typewriters available for sale is right or wrong, I'd still like to buy one of the Indian-made machines. I do have "brand new", never-been-used manual portables made in China, including the Olivetti and the much-classier Olympia. But I have failed in the past to even track down a site from which one can buy one of the Indian machines online. Again, I'd like to be enlightened on this, if anyone knows how to buy one. Hi Robert, in a search for Olympia-related info, I came upon this: http://www.olympiaph.com.ph/crm/typewriters.html and wondered if these were Chinese or Indian in origin? Hi Rob. The Traveller De Luxe (Traveller C) is the one I have, and it's made in China (and still being made and sold, as far as I know). Following various markings on the carton, mine appeared to have been imported into Mexico, then on to the US, then shipped from there to Australia. The Carina 3 and SG3 look to me to be "new-old" stock - I very much doubt these are still being made, especially in this design. As far as I know, the Traveller design is distinct to the Chinese manufacturers; the last of the Olympias made in Japan were the "Olympiettes". To the best of my knowledge, the designs of the machines produced by that Indian factory were distinct to that manufacturer - in other words, they were not making typewriters for Olivetti-Royal or Olympia, and other models (Rover etc) with different outer casings, as the Chinese manuifacturers are/were. I quite like the Olympia, but would advise anyone to steer well clear of the others, most especially the Olivetti. It's had some woeful reviews, and looks awful. Still, the end of Godrej manual standards is a sad landmark, and the writing is on the wall for mechanical typewriters in general. I've now been interviewed on this topic by an NPR show (The Takeaway), CBS Radio, and a newspaper. I also got requests from the BBC and yes, Australian Broadcasting Corp., but I don't know whether time differences will allow me to speak to them. This is the most attention I've gotten as a typewriter expert since the Bush memo story. Fortunately there isn't partisanship and rancor associated with this story! I believe I've read that the Godrej was a modification of an Optima design. My understanding is the mechanism of the Chinese machines are all of what was originally a Brother (Japanese) design. Just the outer casings differ, by and large. But Will Davis is the expert in this field. His site covers Chinese-made machines extensively, but as far as I know not Indian-made machines. ... and it's even more ironic that this comes after news stories about how manual typewriters are being discovered and cherished by young people. Hate to sound materialistic here, but does this sudden burst of worldwide publicity mean the value of old typewriters ("There's no more being made .. get one while you can") has just gone through the roof? 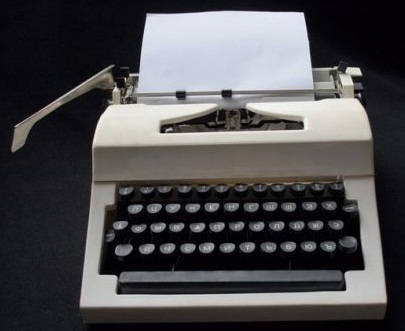 With every "The Typewriter is Dead" story that's run I can hear the wheezy laugh of some technology slave chiding those few who hold on to typewriters as "backwards" and "out of step." Well, über nerd, the joke is on you. Your computer will never ever make the century mark. It won't make it 50 years. It will be a pile of junk in 25 years. While you are in line for the next gadget with its included false sense of freedom, I'm going to be living life. I think that conservation is anathema to the digital mind. You, my friend, are a freakishly rare gem. I love the commentary. It's letting me pull out my grumbly old man face; something my wife adores! Hola Gente tengo en mis manos una Olimpia Carina 3 Made In Japan, maquina y estuche en perfectas condiciones!! !